Concrete is likely to continue to be the primary volume construction material for most structural applications and its use is likely to grow in future. Cement manufacture produces large amounts of CO2 and consequently accounts for about 5% of total global anthropogenic CO2 emissions. The pressure to reduce energy consumption and CO2 emissions during cement manufacture has led the industry to look at developing novel cements based on alternative clinkers with intrinsically lower energy requirements and CO2 emissions on manufacture than conventional Portland cement clinkers. This report summarises work on cements based not on tricalcium silicate (alite, the major phase in Portland cement), but instead on dicalcium silicate (belite) as the major phase. Calcium sulfoaluminate (ye’elimite) and calcium alumino-ferrite (ferrite) are the other two principal phases. It specifically focuses on the Lafarge-patented variety (Aether cements). These cements can be made from conventional raw materials, in existing industrial installations and offer similar performances to CEM I Portland cement, but with 25–30% lower CO2 emissions. 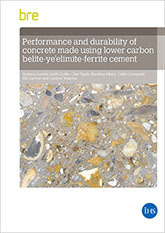 This report is aimed at cement and concrete technologists, materials scientists, specifiers and consulting engineers.